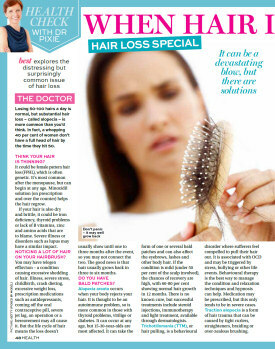 In their Hair Loss Special Best Magazine explore the distressing but surprisingly common issue of hair loss with expert suggestions from Lucinda. 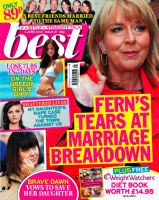 Best explores the distressing but surprisingly common issue of hair loss. It can be a devastating blow, but there are solutions. Losing 50-100 hairs a day is normal, but substantial hair loss – called alopecia – is more common than you’d think. In fact, a whopping 40 per cent of women don’t have a full head of hair by the time they hit 50. Think Your Hair is Thinning? It could be female pattern hair loss (FPHL), which is often genetic. It’s most common after the menopause, but can begin at any age. Minoxidil solution (on prescription and over the counter) helps the hair regrow. If your hair is also dry and brittle, it could be iron deficiency, thyroid problems or lack of B vitamins, zinc and amino acids that are to blame. Severe illness or disorders such as lupus may have a similar impact. Noticing a Lot of Hair on Your Hairbrush? You may have telogen effluvium – a condition causing excessive shedding of hair. Illness, severe stress, childbirth, crash dieting, excessive weight loss, prescription medications such as antidepressants, coming off the oral contraceptive pill, severe jet lag, an operation or a bereavement may all cause it. But the life cycle of hair means the loss doesn’t usually show until one to three months after the event, so you may not connect the two. The good news is that hair usually grows back in three to six months. Do You Have Bald Patches? Alopecia areata occurs when your body rejects your hair. It is thought to be an autoimmune problem, so is more common in those with thyroid problems, vitiligo or diabetes. It can occur at any age, but 15-30-year-olds are most affected. It can take the form of one or several bald patches and can also affect the eyebrows, lashes and other body hair. If the condition is mild (under 50 per cent of the scalp involved), the chances of recovery are high, with 60-80 per cent showing normal hair growth in 12 months. There is no known cure, but successful treatments include steroid injections, immunotherapy and light treatment, available through dermatologists. Trichotillomania (TTM), or hair pulling, is a behavioural disorder where sufferers feel compelled to pull their hair out. It is associated with OCD and may be triggered by stress, bullying or other life events. Behavioural therapy is the best way to manage the condition and relaxation techniques and hypnosis can help. Medication may be prescribed, but this only tends to be in severe cases. Traction alopecia is a form of hair trauma that can be caused by tight curlers, straighteners, braiding or over-zealous brushing. Lucinda Ellery’s hair fell out when she was 10 years old. She now runs hair-loss clinics across the country. The reflection of light on your scalp really shows the gaps, but Fullmore scalp make-up is a brilliant cover-up. Take the entire length of hair and, starting at the ends, not the root, sweep a bristle brush back to the scalp. Then style with your fingers. You need 6-8in of hair to use clip-in extensions, but they’re fantastic. They cost between £10 and £30, and don’t have to be real hair. With these ultra-fine hair extensions, you can cover a 10in patch for £250–£350 and it’ll last for three months. Suitable for patches or the whole head, this is a mesh through which your own hair is lifted, strand by strand, and extensions added. It costs between £1,500 and £1,800 and lasts for two years, growing back with your real hair. These can feel hot, itchy and insecure, but they’re an excellent cover-up. Cut and style your wig and stitch it on the inside if it feels too loose. 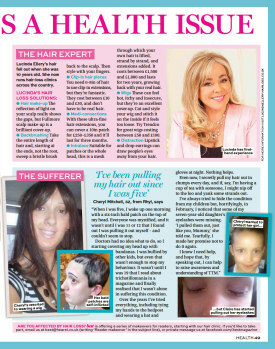 Try Trendco for great wigs costing between £50 and £100. Lipstick and drop earrings can draw people’s eyes away from your hair. “When I was five, I woke up one morning with a six-inch bald patch on the top of my head. Everyone was mystified, and it wasn’t until I was 11 or 12 that I found out I was pulling it out myself – and couldn’t seem to stop. Doctors had no idea what to do, so I starting covering my head up with bandanas. I was bullied by other kids, but even that wasn’t enough to stop my behaviour. It wasn’t until I was 19 that I read about trichotillomania in a magazine and finally realised that I wasn’t alone in suffering this condition. Over the years I’ve tried everything, including tying my hands to the bedpost and wearing a hat and gloves at night. Nothing helps. Even now, I secretly pull my hair out in clumps every day, and if, say, I’m having a cup of tea with someone, I might nip off to the loo and yank some strands out. I’ve always tried to hide the condition from my children but, horrifyingly, in February, I noticed that some of my seven-year-old daughter’s eyelashes were missing. ‘I pulled them out, just like you, Mummy,’ she told me. Tearfully, I made her promise not to do it again.